The Good Copy Shop - The Design Files | Australia's most popular design blog. The Good Copy class of 2014! Featuring (back row from left) - Kelly Jack (Operations Manager), Kane Daniel (Editor), Meredith Forrester (Editor), Brodie Lancaster (Editor), (front row from left) Max Olijnyk (Creative Director), Frunch Nazarri (Managing Director), Penny Modra (Editorial Director), and Melissa Ross (Strategy Director). Photo - Eve Wilson, production - Lisa Marie Corso / The Design Files. The Good Copy team in the brand new The Good Copy shop, which opens its doors today! Photo - Eve Wilson, production - Lisa Marie Corso / The Design Files. Shop details - The Good Copy custom stationery including reporter style notebooks, hand-bound composition notebooks, and mugs designed by Stuart Geddes and Rob Cordiner of Smalltime Projects, international magazines, local publication Filmme Fatales, and 'I Want To Believe' poster by Rob Cordiner. If you look closer the UFO is actually a pen! Photo - Eve Wilson, production - Lisa Marie Corso / The Design Files. Details from The Good Copy library, where visitors are encouraged to sit and read a curated edit of indie publications - Head Full of Snakes by Stuart Geddes and Luke Wood, No Limit by Holly Childs, and Kosciusko by Max Olijnyk Photo - Eve Wilson, production - Lisa Marie Corso / The Design Files. Today's post is one we've been DYING to share for some time, mainly because the clever crew behind The Good Copy are good pals of ours – they include Penny Modra (previously editor of Three Thousand) and Frunch Nazzari (jack of many trades but most notably, previous co-owner of Right Angle Studio which publishes The Thousands, and current co-founder/managing director of The Rooftop Cinema). Essentially combining a creative and copywriting agency with a supportive hub for local writers and publishers, The Good Copy is such a tremendous idea! It was, for a long time, a pipe dream in the minds of co-founders Penny and Frunch – a kind of utopian workplace where clever writers could take on commercial writing jobs that pay the bills, while also having the time and support to work on their own independent writing projects. As Creative Director Max explains below, 'The Good Copy is a writing studio, a publisher, a shop and a school'. After two years in development, The Good Copy creative agency finally hit its stride earlier this year, moving into a studio space, expanding their team, and taking on a stable of clients for whom they produce custom written content. TODAY they're launching the next phase of their business – The Good Copy Shop! The Good Copy Shop is a shop for people who write. It stocks dictionaries, style guides, books about writing and writers, and a carefully considered edit of magazines, books, journals and zines of note, both local and international. They also stock a range of stationery – the essential four-colour pens (The Good Copy brand identity is based around the four-colour pen! ), rulers, 'Freelancer' slippers, and custom TGC merchandise including reporter style notebooks, hand-bound composition notebooks, and mugs designed by local designers Rob Cordiner of Smalltime Projects and Stuart Geddes. With a versatile fit out by local interior designer Rosie Scott, all of the shop furniture either folds up on itself, rolls around on castors, or can be used for several purposes. This means the space can also function as an event space, which is handy, because soon The Good Copy Shop will also launch their very own WRITING SCHOOL, with workshops to be held on site in their light-filled studio space on Johnston St, Collingwood! We are particularly excited about Penny and Max's grammar class for grown ups called 'Stop. Grammar Time', which promises to be as entertaining as it is informative! Keep your eyes firmly glued to The Good Copy website for their first semester timetable, which will be out very soon! Tell us a bit about The Good Copy and what you guys do? Max Olijnyk: The Good Copy is a writing studio, a publisher, a shop and a school. Our writers work on commercial jobs across a variety of subjects and styles, and we balance that by supporting their independent projects. Penny Modra: Basically we wanted to create a business that allows writers to take on commercial jobs in a team environment (i.e., with the support of other writers, project managers and editors). As a writer I think the key to life is avoiding mojo-sapping. So, finding a way to work on well-paying jobs without those jobs swamping your brain seven days a week. I hope TGC will help with that, and give our writers mental/financial breathing space to work on their own projects. You can't live on feature articles any more. If you could eat a feature article that would be a different story. But even so, not tasty. Our main emphasis in the shop and the school will be on writing as a trade (rather than a magical, literary skill). So it’s pretty hands-on. It’s about the everydayness of writing, getting it done and improving through effort. Max: The school is for everyone – from working writers who want to brush up on their skills, to designers, zookeepers and politicians who want to feel more confident in their written communication. Basically The Good Copy is our idea of how things should be for writers and writing in general. After getting our Everyday Coffee fix and walking past Magic Johnston we always see The Good Copy team busily working away, can you tell us a little about your team? Max: Penny Modra and Frunch Nazzari are partners in The Good Copy, then we have a crack team of writers and organisey-types, as well as another dude named Max who comes in and does our accounts. He’s the best. Our writing team includes Brodie Lancaster, who edits her own zine Filmme Fatales on top of working on things for us. Penny: Our other in-house writers are Kane Daniel (who also works at Smith Journal and writes for Vice, and Noisey) and Meredith Forrester, who's in charge of our grammar school curriculum and also copy edits Monster Children, and her own blog Lady Style Guide. We work with some great writers on a freelance basis, too (code for ‘they don't have to come in to the office and put up with us’) — Mel Campbell, Sarah Booth and Toby Fehily. Max: Oh, and me! I am in charge of the shop and all the fun stuff, but I also write for quite a few different magazines, newspapers and websites. We are super excited that the retail incarnation of The Good Copy, The Good Copy Shop, opens today! What can we expect from the shop? Max: The idea of the shop is to sell the kind of stuff that people who work as writers will be interested in. We stock dictionaries, style guides, books about writing and writers, and a range of publications from around the world that feature great writing. There is a library section of the shop, which is stocked with an ever-evolving selection of titles from our own collections — things that might not be easy to find these days, but that we think are awesome. For starters, we have copies of Interview magazine from the '70s, skate magazines from the '90s and our own old zines from the '00s. People are welcome to come in and browse at any time. We also stock a range of stationery: four-colour pens (our brand identity is based around the four-colour pen), rulers, Palomino Blackwing pencils and Staedler erasers. We’re selling these awesome slippers called Cheesy Flops, but we call them ‘The Freelancer’. They’re house shoes from Iran and we love them—and we’ll be extending our range of writers' hardware as our empire expands. Penny: One of my favourite things in the shop is our 'Yes' flag. It's an artwork by Oslo Davis, based on an artwork by Jon Campbell. 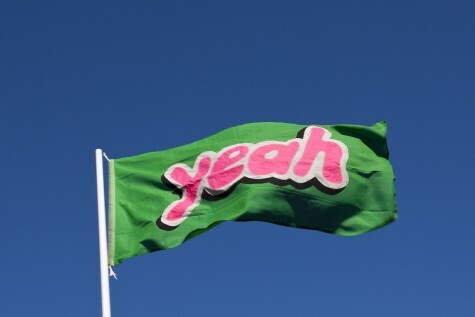 Oslo took Jon's famous 'Yeah' flag and made a grammatically correct version of it. Oh Oslo. 'Yes' flag by Oslo Davis at The Good Copy Shop, based on an artwork by Jon Campbell. Oslo took Jon's famous 'Yeah' flag and made a grammatically correct version of it. Photo - Eve Wilson, production - Lisa Marie Corso / The Design Files. What types of events will you host in the space? Max: We’ll be rolling out our first series of classes in the next few months. The classes will be a refresher course on basic grammar and spelling for people who work with words—which, let’s face it, is everyone. They’ll also be funny and there will be free coffee. We'll be holding regular launches for our own publications and ventures, as well as for people who we feel are doing good things. We've hosted a few great book and zine launches already! Penny: We'll be hosting one-off talks and panel discussions, too. Oh, and movie nights. But we're only showing movies about writers. All The President's Men, Broadcast News, Harriet The Spy, Press Gang. You know, the greats. Max: We’re looking forward to opening the shop and launching our website! The next event we’re hosting is the launch of Witu’s new range on Friday. We’re also working on a special collaborative piece with Witu for our hardware department, which is really exciting. We're working on a proper launch party for the shop, some more publications, and, you know, loads of other stuff! Penny: I'm looking forward to meeting more writers. I KNOW YOU'RE OUT THERE PEOPLE. Exit your homes. And sending out our first edition of The Good Copy Gazette, AKA The Gaz. A mix of helpful writing inspiration, neighbourhood news and unhelpful distraction. The Good Copy Shop is open every day THIS WEEK ONLY! GET AMONGST IT, people. From next week their opening hours will be scaled back a bit – keep your eye on their website for details. The Good Copy studio and creative agency. Photo - Eve Wilson, production - Lisa Marie Corso / The Design Files. Hand-bound composition notebooks made especially for The Good Copy shop, and the writers' pen of choice - the four colour pen! Photo - Eve Wilson, production - Lisa Marie Corso / The Design Files. A selection of zines, publications, and writing manuals available at The Good Copy shop. Photo - Eve Wilson, production - Lisa Marie Corso / The Design Files. The Good Copy Shop. Photo - Eve Wilson, production - Lisa Marie Corso / The Design Files. Just wanted to find out where the work tables in the studio are from, they are amazing! Can’t wait to visit and learn! Congratulations on getting the business up and running. Grammar classes are a great idea, but hard to follow up as a potential customer. The website suggests I sign up for a newsletter if I would like to hear about upcoming classes, but I cannot find a ‘newsletter’ or ‘contact’ link. What an idea! Can’t wait to check this out. Hi Potential customer, I went to the relevant page on their site http://thegoodcopy.com.au/school/ and clicked up the top right where it says “newsletter”. A cursor comes up and while there are no instructions, I figured I should put my email address in. It said “Working” and then it said “Finally!” so I guess I am subscribed to the newsletter now. I haven’t got any email confirmation or anything though. Hi Potential Customer! Thanks for checking out the site. The newsletter link is at the top right of the screen on our site, check it! The newsletter link isn’t labelled if I use Internet Explorer. All that’s visible are the two horizontal lines, even on the website’s main page. This makes the newsletter link pretty hard to identify! I’ve encountered this problem on the two computers I’ve tried and the problem persists. You might want to follow this up so that your site is as accessible as possible. My computer runs an older version of IE due to depressingly limited office IT support, and I assume others are in the same situation. It’s fine in Firefox (I tried a new browser based on the comment left by ‘Potential newsletter subscriber’). I haven’t checked other browsers. Hope this feedback helps. Best of luck with the shop and business! Hi again Potential customer – ahhh, thanks for picking that up. We just launched our site today so there are still a couple of creases to iron out, that one being a very important one!! As far as contact details go, you can find them in the site’s footer. Many thanks for your input. What a wonderful Idea. We need something like this in NZ… Good luck for the future. SO GREAT! Love your work Team TGC! Can’t wait to come and visit when I get home!